ARABIC TITLE : ايات قريبة المعنى "AYAT QAREEBAT AL-MAANA". It has around 1200 Verses from the HOLY QURAN with similar meaning, in groups of 2,3 or more verses. A headings were introduced for those groups and sub-sections to facilitate the understanding of each group, bearing in mind that I have built the whole book sorted according to Chapter and Verse number. This book shows examples of the Strength, Beauty, Diversity, and Importance of HOLY QURAN 6600 verses in keeping the Arabic language alive. 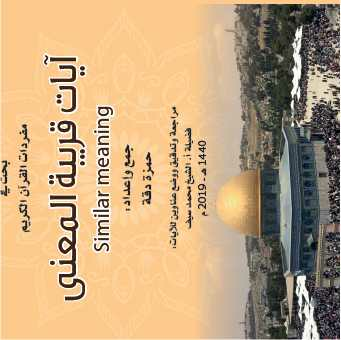 It is therefore of interest to both Scholars/Researchers, Schools as well as Arabic Language loving readers. Based in the United Kingdom, ENGLISH HEADINGS ARE BEING USED, WHEREBY IT INCLUDES SAHEEH INTERNATIONAL ENGLISH TRANSLATION of one Aya (verse) per group. Therefore, the current ISBN cannot be used . It will be printed in the UK before end of April 2019. The content of this book is being added to a similar update having exactly same size (138 Page) to form a new book with total pages of 276. A new ISBN number will be used.